Detailed simulations of planetary formation are revealing how tiny grains of dust turn into giant planets and could shed light on where to find new Earth-like worlds. Scientists theorise that planets form from rotating discs of gas that surround newly formed stars, known as proto-planetary discs. Pebble-sized objects in these discs then clump together to form cores of would-be planets. Professor Anders Johansen from Lund University in Sweden, has gone right down to the level of atomic nuclei and molecules to try and work out how cosmic dust particles stick together in pebbles and then turn into baby planets, known as planetesimals. "Planet formation takes place when these dust particles collide, and they grow to larger and larger sizes," he said. "This growth takes us then from micrometres, all the way up to 10,000 kilometres or so." One clue to how this dust forms into pebbles can be found on Earth in meteorites – pieces of asteroids that are leftovers from the formation of the solar system. "There's a mystery in there," Prof. Johansen said. "If you look inside an asteroid, you do find millimetre-sized pebbles, which is fine. But the problem with those pebbles is they are not what we expect them to be. We would expect them to be fluffy dust aggregates, a bit like if you have a sandbox after it rains, and you can pick up a piece of dried out sand that is very fragile," he said. Instead, the pebbles are spherical and hard, like they have been heated and cooled – similar to objects that have been struck by lightning. "Lightning takes place as thunderclouds discharge their electric charge to the ground," said Prof. Johansen. "This discharge is very similar to the shock you experience from the static electricity when you put on a jumper." Prof. Johansen theorised that there must be a mechanism during planet formation that creates positively and negatively charged particles, and he and his team investigated what that was. 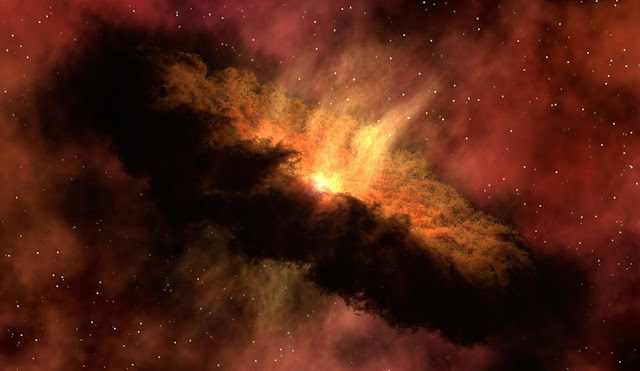 "While a thundercloud obtains a charge difference between its top and bottom by falling hail particles, we found that in the protoplanetary disc the decay of a radioactive element called Aluminium-26 is very efficient at charging dust clouds," he said. The finding was part of a project called PLANETESYS, which is using computer simulations to replicate the physical processes taking place when planets form – all the way from dust to a planetary system. It includes details about the chemical composition of each pebble. One thing Prof. Johansen can examine from looking at this chemical composition is how planets accrete water – a vital ingredient for life. "An obvious question is, "How much water does a planet get?" We can begin to speculate about if it's normal to get the Earth's amount of water, if it's a lot of water or a little bit. But maybe you can also get too much water, which may be good for life but not good for civilisations," he said. Dr. Bertram Bitsch from the Max Planck Institute for Astronomy in Heidelberg, Germany, says that understanding more about how planets arise would help identify potentially habitable planets elsewhere in the universe. "If you understand more (about) the formation process of how we can make a system like the solar system, then we can maybe make predictions (about) how often these systems would exist and how common it would be to find Earth-like planets (orbiting) other stars." "Then, if we see a certain composition of the system … that might allow us to see that there might be habitable planets in those systems." Dr. Bitsch thinks he might know the recipe for how solar systems end up with Earth-like planets. With a careful blending of conditions, from where baby planets form, to their chemical composition and gravitational interactions, he can try to model the conditions to generate solar systems with habitable planets. But figuring out the right recipe requires working backwards after running many simulations with complex supercomputing power, which he's doing in a project called PAMDORA which runs until 2022. "I want to use computer simulations … where we look at the gravitational interactions between multiple bodies to model the stages from planetesimals all the way to fully formed planetary systems with terrestrial planets, super Earths, and gas giants," he said. In his simulations, Dr. Bitsch looks at the how pebbles in the swirling discs form into moon-size planetary embryos, which then develop into fully formed planets. Altering the different mechanisms at work can influence what types of planets a solar system may end up with. "There are many different pathways that can happen, and many different parameters that can influence the outcome of the simulations," he said. "For example, how big are the pebbles, how many would there be, and where would your initial planetesimals form that would then start to form proto-planets?" To see which variables matter most, he runs hundreds of computer simulations that last weeks at a time and can simulate tens of millions of years to model the highly chaotic meetings of multiple objects. For Earth-like planets, one key factor is how close baby planets form to their home star, since the difference in temperature can determine if planets accrete water directly during the gas-disc stage or from a late water delivery from asteroids or comets, like for our own Earth. "One thing that is already in the code is looking at the composition of super-Earths. For example, are they rocky or dominated by water-ice?" Dr. Bitsch said. Super-Earths, which are planets like the Earth, but maybe two to ten times more massive, don't exist in our solar system, but are relatively common among other stars. "Lots of super-Earths have been found and detected, and the question is what are they made of? This can give us the answer to where they have been formed."